Buying a new laptop is probably one of the most difficult things to do, harder when you’re a budget and just downright frustrating when you are even remotely slightly tech-savvy. Without any budget restrictions, you can just point your mouse at something you like, and onwards to the checkout page. The higher the price range, the less you have to choose from, which makes choosing easy. But when you’re on a budget, the market is a little more saturated with every other manufacturer offering several options within the same price-range, the result is hundreds of laptops that look alike, seem alike but offer varying degrees of performance and satisfaction. And when you know the ins and outs of what makes a good computer, the process becomes more annoying because you’re more likely to analyze and ascertain which budget laptop gives you the most bang for back. In the end, I settled with HP Stream 13. It took a lot of weighing the pros and cons before I made the decision. Some of the factors that I chose to consider when buying the laptop were screen size, processing power and battery life. A lot of these factors were depended on my needs, which were not much. I wanted something that I could carry around without feeling like I had a rocks in my bag. And I only had a budget of approximately $250. I was deciding between a couple of refurbished/used computers and the HP Stream 13. In the end, I felt much more comfortable purchasing the Stream, mostly because I managed to snag it for a solid $200 thanks to a small sale and an Amazon Store Gift Card. So, am I happy with my purchase? HP Stream 13 might not win any awards any time soon but it has a few things going for it that hits a really sweet spot. The HP Stream comes in two colors, Horizon Blue and Orchid Magenta. Not being quite a fan of the color Orchid or Magenta, I opted to go for the Horizon Blue. I’m personally a fan of neutral dark colors so I considered getting a blue laptop a sacrifice I willingly made as a trade off for affordability. But I was actually pleasantly surprised by how beautiful it actually was. It’s a mixture of three blues different blues. The lid itself all over is a nice cobalt blue as well as the bottom. The keypad side has dot patterns all over and a gradient that leads from horizon at the top to sky blue at the bottom. The keyboard itself is probably one of its strongest feature. The keys feel really tactile and comfortable to use. The gaps between the keys makes it easy to type fast and know where your fingers are and should go next. Those who enjoy typing fast feel at home right away. The style is actually is very similar to a macbook keyboard except with an additional row of keys. The touchpad is also pretty similar to a Macbook. I personally prefer that the left/right click of my touch pads are separated but I use a wireless mouse anyway so it’s not a huge deal. However, while the touchpad is really smooth, I’ve found that it can be a little too responsive and it’ll end up dragging out chrome tabs when I’m just trying to change them. Thankfully, that doesn’t happen often enough to be a dealbreaker. I really hate 1366×768 resolution screens. It feels inadequate and I don’t know if it’s just me but most sites feel like they don’t fit anymore on those dimensions. I think 1600×900 should replace that standard and become the new norm. Might be a little too much for a 13” screen, nonetheless, it should happen. Screen res griping aside, this is actually a pretty good screen. It has a matte coating on it for anti-glare, and the viewability in daylight is amazing. I currently have the brightness lowered almost all the way, sitting at a cafe in broad daylight and have no issues seeing anything on screen. The viewing angle isn’t the best, but unless you have it in a weird angle, it should be more than fine. The bezel is probably a little thicker than it needs to be too. The laptop comes with a 32GB eMMC drive, which is flash storage but not quite an HDD, and far from an SSD. While it performs well enough it’s nowhere near how an SSD would perform. This was one of the sacrifices that I made for affordability. I have no intention of taking this further than Microsoft Office, Spotify and a bunch of smaller applications like 7z and Adobe Reader. As of right now, I have 10GB free, while almost more than half of the drive is taken up by the Windows Installation. I’m hoping that I won’t be running out of crucial space anytime soon. I’ve so far been unable to find whether the HDD is upgradable and if so, I’d probably be interested in putting in an SSD on it instead. The Stream’s storage and power are probably its weakest feature. It was a hard choice to make going for a celeron processor as opposed to a Core i3 (Acer Aspire S3 was one I had been looking at), but going for the Core processor would have meant increasing my budget, something I was unwilling to do. And added to that a meager 2GB DDR3L (low voltage, lower power), it’s really not the strongest computer, and you can see it being stressed at certain times. Opening too many chrome tabs for example will cause some hiccups. HD videos on youtube had a hard time playing for most of the part – Actually, let me backtrack. I started to wonder why it was performing so badly. This laptop can’t be that weak. And I was right. I opened up the same video from YouTube (Age of Ultron Trailer at 60fps) on Internet Explorer, and it ran rather swimmingly – not a single hiccup even at 1080p. Chrome really needs to be less of a powerhog than it is. I don’t think I can afford to run Chrome on this laptop if it eats up so much resources, not only slowing it down but eating up more battery too. Speaking of which, the battery life is actually really, really good – which is the positive part of the trade for all that lack of power. I’ve been running it from a full charge for about 7 hours now and it still has life left yet. So unless you’re doing something really process heavy, forgetting your charger once in a while wouldn’t be a big deal. However, the power brick (and the laptop) is so light that it’s really no burden having it in your backpack when you go out. 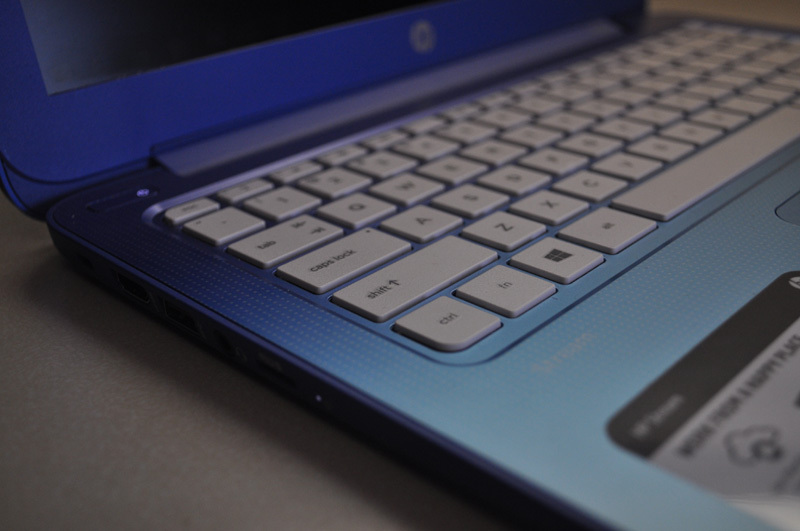 Simply put, the HP Stream 13 so far shines in the battery life department. Lacking a traditional HDD, I’ve barely heard a peep from this laptop, not even a fan for the processor (maybe I need to see what happens when I really stress it). So that’s another thing it’s got going for it. Other things: I wish the sound was a little louder. If you’ve got a bunch of people in the room and there’s conversation, you might have a hard time getting through the noise with the default speakers of the laptop. Minus, there’s good sound clarity – it’s clean and crisp and I’ve not heard any static or noise when it gets too loud. The laptop turns on really fast from sleep which is really nice. You can just come back to whatever you were working on just by closing the lid. The power slot is on the right side next to two USB 2.0s, which are a little weird – it’s always a little stiff when plugging something in. The left side of the Laptop has an HDMI, a USB 3.0, a 3.5mm audio jack (no mic) and a microSD slot, with the power button is located on the top left of the keypad. Finally the speaker is at the bottom of the laptop. If you’re looking for a budget laptop and you do not want a Chrome OS device, then this is the perfect laptop for you. The HP Stream 13 is $217, at the time of writing this, on amazon and the HP Stream 11 (11 inch screen) is $199. If you’re willing to up your budget a little bit, you might be better off with something that has an i3 for a little more power. But if you’re absolutely stretched thin like I am, then the HP Stream is a good compromise between power and affordability.